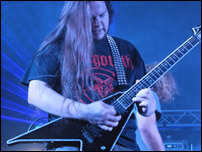 Derek: Pantera, Death, Children of Bodom, Opeth, Necrophagist, Kalmah, At The Gates, Amon Amarth, Lamb of God, Dethklok (Yes, Dethklok) Slayer, All Shall Perish, Obscura, Nevermore, Ronald McDonald and um.... Myself? Having a reputation as one of Green Bay’s most upcoming and brutal bands in the metal scene can really put pressure on a band to live up to this. 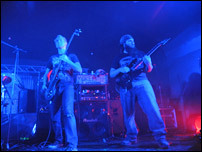 Local Green Bay melodic death metallers, Atreus, certainly exceeded my expectations after attending their most recent performance at the Riverside Ballroom. 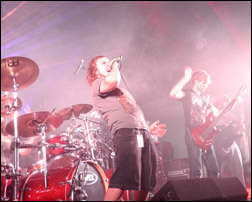 They were direct support for the Noise Revolution Tour featuring Static X, Emmure and Ill Nino. Having the ability and talent to produce such a melodic and killer sound is something that is really growing in the Green Bay scene, with Atreus leading the way. Having started out as an 80’s cover band, they have come a long way in developing their sound and solidifying their lineup. Harvesting their name from the Greek mythological King Atreus, the band definitely packs the brutality of the story behind their name. From craigslist to train stations to Guitar Center, Atreus slowly began to take form with its members and become the monster they are today. As far as the music aspect and style goes, melodic death metal is a genre that the Green Bay scene has not seen much of until now. “As the lineup changed, it pretty much became Dean and I writing everything together,” explains guitarist Derek. “We always liked melodic stuff but it was really an overtime thing that it turned into melodic death,” Dean comments back. They also went onto explain that they wanted to play that genre because there just really wasn’t any of that music being played in the area. With a demo in their arsenal but still currently unsigned, Atreus plans to take their time and save money so that they will be able to make a good first impression with a better recording of their current demo. Once this is complete they plan to use that as the foundation for a press kit that they will then send out to labels. Even possibly self-releasing this newly recording demo is something that they might also look into doing if they feel that is the right course of action. Lead vocalist Sean was the one who put the entire show together, from catering, to booking the bands and press, he did it all and it couldn’t have turned out better. It was amazing to see the scorching live performance he lead Atreus in after running around and setting up for the show all day. This local Green Bay band is an extremely talented group of musicians and some of the most down to earth and nicest guys I have met in the scene. Their motivation and musical drive is without a doubt why they live up to their reputation and what has given them the success they have had so far. Make sure you don’t miss their performance at the upcoming Savagefest in Appleton, WI on November 3rd.